The two names are synonymous with ultimate hero and vilest villain, right up there with Batman and the Joker, the Fantastic Four and Doctor Doom or Luke Skywalker and Darth Vader. Superman and Luthor have been duking it out since 1940. In DC’s Rebirth, Superman and Lex have to once again get reacquainted. At the end of DC’s The New 52, Superman died. Now there is a new Superman, a Rebirth Superman if you will, who knows nothing of Lex Luthor; the one who was the Good Samaritan and member of the Justice League, as he was in The New 52. This Rebirth Superman (the same one who died at the hands of Doomsday in the 1990’s then was resurrected) knowns Luthor to be the embodiment of evil. Imagine if this Superman was forced to choose between the life and death of Lex Luthor. This is exactly the dilemma facing the Man of Steel in Superman Action Comics Rebirth: Men of Steel. The comic series runs six issues (Superman Action Comics Rebirth #967-972). It begins with Lex Luthor giving Lois Lane a tour of his facility and new Super Suit of armour. With no warning, Lex is attacked by two massive otherworldly creatures. Superman swoops in to save the day, only to learn the two giant-sized attackers have come to kill Luthor. Their reason—in the future, Luthor will ascend Darkseid’s throne in Apokolips and destroy countless beings and planets. They have come to Earth to remove the future threat. Now the Last Son of Krypton is faced with one of his greatest choices—let Luthor die or save the man who’s been a thorn in his side for over 75 years. Writer Dan Jurgens picks up right where he left off in Superman Action Comics: Path of Doom (see my review for more). In Superman Action Comics: Men of Steel, the action is palpable. It’s non-stop, relentless and keeps the pages turning. This comic series is essentially about two men, two foes, who are forced together. Only, this is a different Lex Luthor. Not only because of his personality, but he also has a Super Suit—one that bears Superman’s emblem on the chest. And for all the incarnations Lex has had with suits (who can forget his green and purple War Suit), this is one of his best. Jurgens also introduces two characters, L’Call and Zade. 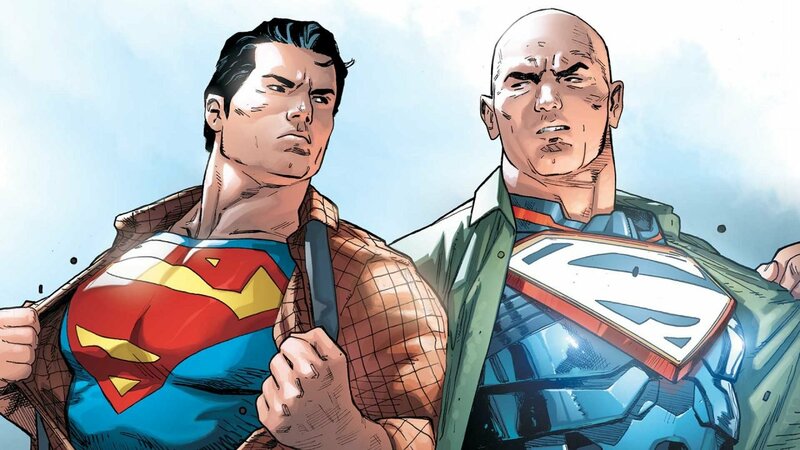 Massive in size, warriors at heart, these two are quality opponents for both Superman and a Super Suited Lex Luthor. L’Call and Zade are warriors with heart. As Jurgens reveals throughout Superman Action Comics: Men of Steel, there is a tragic past, a past at the ruthless hands of Darkseid that compels these behemoths to act. Artist Tyler Kirkham does a wonderful job depicting the fierce fighting of L’Call and Zade. Kirkham also excels once again with the splash pages, action sequences and otherworldly locales, as this story takes us to planets light years away. The one drawback to Superman Action Comics: Men of Steel is the ending. After such a buildup, and so much at stake, the ending is too quick and easy. Although there is a nice teaser at the end, it left me wanting more—but not in a good way. Unsatisfied would be the word. It doesn’t make the comic series something to avoid. Superman Action Comics: Men of Steel is a good read, but it would have been that much better had the ending been more satisfying. Perhaps L’Call and Zade’s story with Superman and Lex isn’t finished. Only one can hope. This comic series keeps the action front and center in Superman Action Comics: Men of Steel. Definitely a blast to read, hampered slightly by its lack-luster ending.